Digital poster displays are located throughout the Ross campus as well as on the Home and News tabs of My iMpact. You can submit a poster to be displayed in one media or both. To submit your poster, make certain it meets the requirements, then email the file to RossDigitalSigns@umich.edu to be posted on our digital displays. 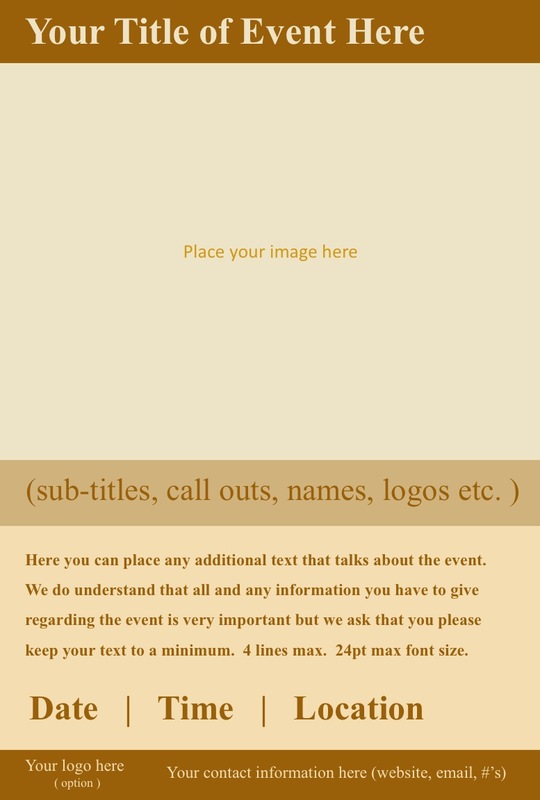 To assist you in meeting the requirements, a number of templates are available below. If you do need help creating your poster file, please allow 3-5 business days for turn around time. 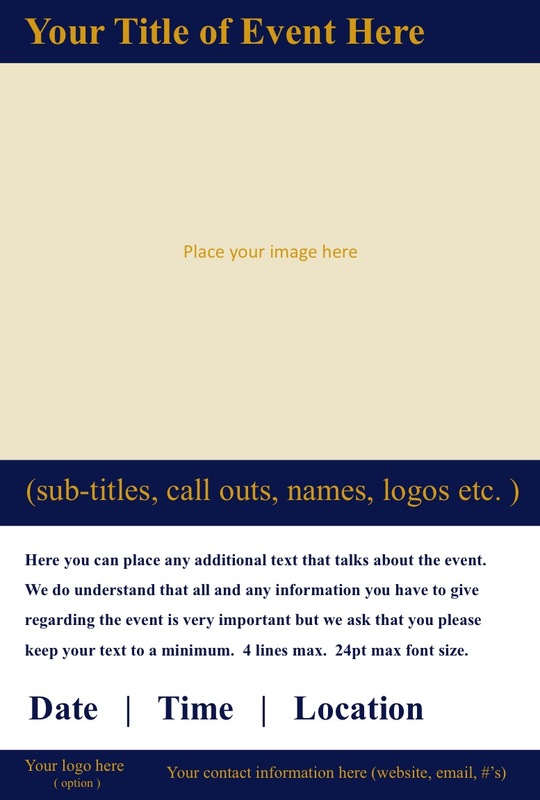 These templates are image free and provide the maximum space for your text. 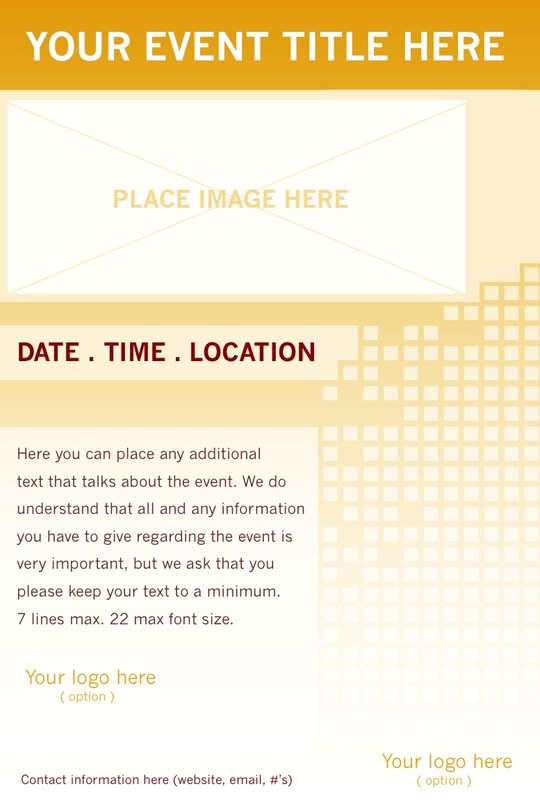 Each template design is provided as a PowerPoint file or a .jpg image, which you can use in the application of your choice. 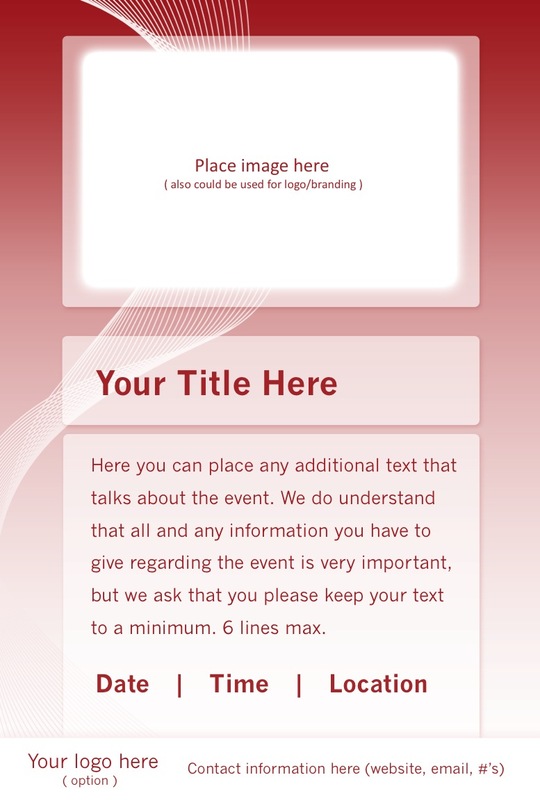 To download a template file, right-click the link and choose "Save Target As..."
The templates provide placeholders for the text and images. Please place your image only in the space provided. Generally your event will be posted to My iMpact the day it is received, unless a specific start and end time is requested. Please allow at least 24 hours for your request to appear on our digital signage rotation (Monday - Friday). If you submit your request on a Saturday or a Sunday, it will not appear until that following week. For future events, your poster will run starting 5 days prior to the event and/or registration deadline. Only under special circumstances will you see your event posted sooner, or run longer than five days. You may use whatever application that you feel most comfortable with. However, ONLY .pdf, .jpg or PowerPoint files with appropriate dimensions will be accepted for input to the displays. Do not use landscape. If using the Ross School of Business Brand (logo) please use the appropriate logo and do not distort or alter the original in any way. More information on the School's brand identity can be found in the Style Guide. It is your responsibility to ensure that any images used in the display design are either copyright free or you have obtained written permission to use the image. Images taken from the web are almost never copyright free. If in doubt about an image you should contact Marketing and Communications to obtain their approval to use the image. If you use an image in your design it should be at least 72 dpi (dots per inch) in resolution. The actual size of the image you use is very important. A small image at 72 dpi cannot be enlarged because it will pixilate. Use an image that is physically large in size....8" x 10", etc and size it down to fit. Files that have pixilated images will be returned. Use large type for readability – small type is nearly impossible to read. If you have information that you feel is critical, use a URL on the display and put the information on a webpage. Avoid using an all white background or even a “mostly” white background... at a minimum use a light color or a tint of a color. White backgrounds will not display as vibrantly as using a medium to dark background with lighter colored text.